(4 a.m. EST) -- The best cruise ships and lines of 2017 -- spread out among ocean, river and luxury categories -- were revealed today in Cruise Critic's 10th annual Editors' Picks Awards. 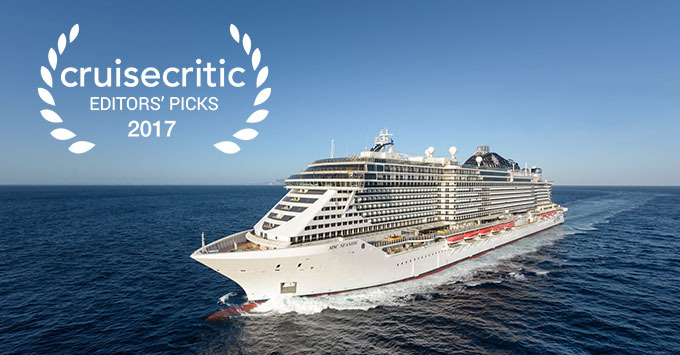 MSC Cruises' MSC Seaside, Uniworld's Joie de Vivre and Silversea's Silver Muse took Best New Ship honors in their respective categories. Selected by Cruise Critic's team of international editors, the awards are given to cruise lines in a variety of categories, including best dining, best cabins and best for families. River cruises and luxury cruises are judged separately. "More now than ever, there really is a cruise for every interest," said Colleen McDaniel, Senior Executive Editor of Cruise Critic. "You can sail to remote areas of the world aboard a small expedition vessel, or in the comfort of a luxury ship complete with spa treatments and gourmet food. You can travel to the Caribbean on a brand-new ship with bells and whistles like water parks and bumper cars, or on a five-masted sailing ship. The options are endless, and this list highlights the lines that have stood out as the best of the best over the past year." Celebrity Cruises snagged awards for Best Cabins and Best for Romance, with editors praising the line's modern and functional cabins, and various places onboard for a romantic escape, including a real lawn for picnics under the stars. A handful of other cruise lines received more than one award, including Carnival Cruise Line -- named Best for Value for the fourth year running, for its affordable fares and wealth of fee-free dining venues and activities, as well as Best Service, a new category in the awards. In the river category, best ship Joie de Vivre was praised by editors as the line's "finest yet," for its tasteful decor, opulent cabins and exceptional crew. Uniworld also received the award for Best Service. AmaWaterways was named the Best River Cruise Line for the second year in a row for its continued dedication to innovation. The line was also awarded Best for Active Cruisers. Meanwhile, Viking River Cruises received three awards -- Best for First-Timers, Best Shore Excursions and Best Enrichment -- a testament to their programming onboard and on land. Silver Muse, best new ship in the luxury category, was described by editors as "offering nearly everything a luxury cruiser could crave." Silversea also won Best for Adventure. Regent Seven Seas was named Best Luxury Cruise Line, and also received an award for Best Cabins. Viking Ocean Cruises, the ocean-cruising arm of Viking River Cruises, received awards for Best for Value and, for the second year, Best Spa. Quebec City was named the Best North American Homeport for its world-class terminal with high-tech amenities, like Wi-Fi, and close proximity to Old Quebec.